Light Guides for Front panels. Most parts within this hugely popular range of standard, ex-stock front panel light guides are available with the option of either 0⁰ or 45⁰ light inject faces. This allows enormous versatility in marrying them with PCBs that are horizontal or vertical to the front panel and with SMD LEDs of types SIDELEDS, TOPLEDS and CHIPLEDS. 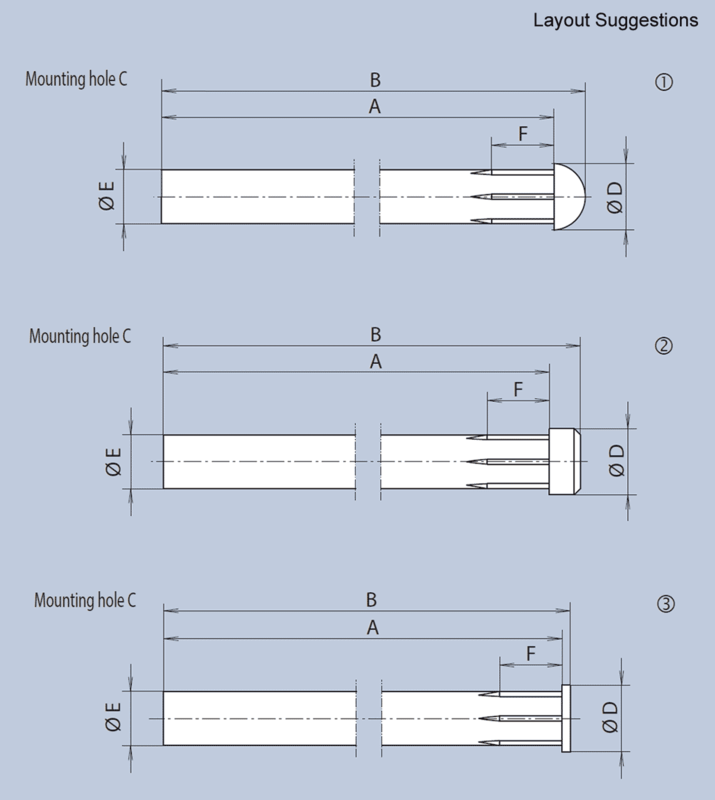 Several “Length A” dimensions are available as standard and infinite variation between 4.5mm and 100mm can be supplied, normally with little or no tooling cost. Assembly is simple by just pressing into the front panel hole. 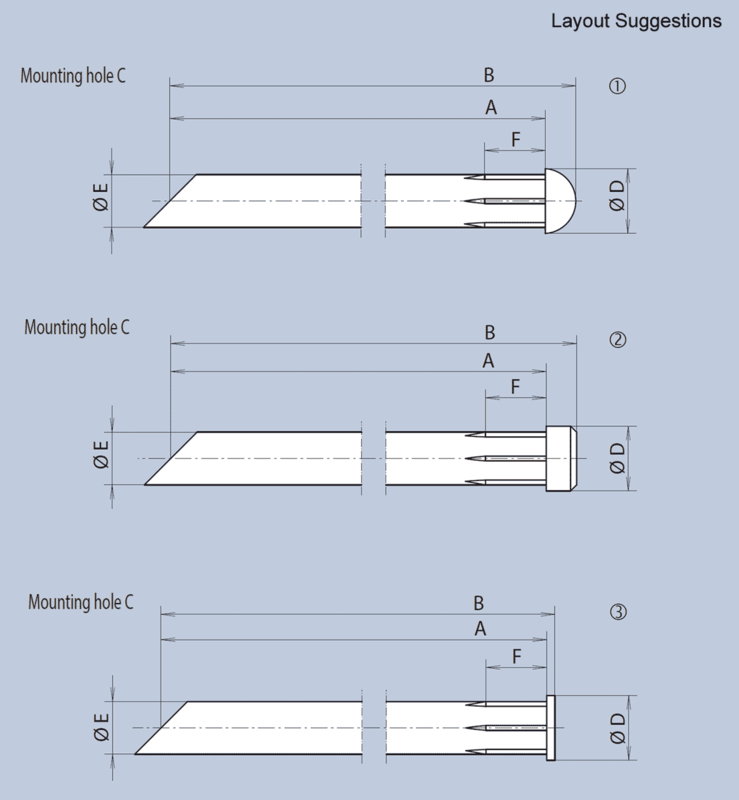 Head types of spherical, planar and counterbore are available, all as standard ex-stock options. Versions using a special diffusing material to produce a frosted effect are available to order, as is self-colouring of the light guides. The latter allows the potential illuminated colour to be shown even when the LED is in an "off" status. 45 46 1.9 2.2 1.5 3 L1-L2 1292.5000A) . .
45 46.5 1.9 2.2 1.5 3 L1-L2 1292.6000A) . .
45 45.4 1.9 2.2 1.5 3 L1-L2 1292.1400A) . .
44.25 45.25 1.9 2.2 1.5 3 L1-L12 1292.7000A) . .
44.25 45.75 1.9 2.2 1.5 3 L1-L12 1292.8000A) . .
44.25 44.65 1.9 2.2 1.5 3 L1-L12 1292.1300A) . .